Particle & Surface Sciences introduces the HPVA Series of gas adsorption analysers from Particulate Systems (a Micromeritics Brand). These volumetric analysers are designed to obtain high-pressure adsorption isotherms using gases such as hydrogen, methane and carbon dioxide based on the static volumetric method. 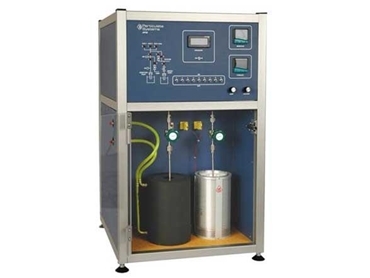 The high pressure volumetric analysers are used in characterizations for catalysts, zeolites, activated carbons, carbon nanotubes and hydrides as well as materials for hydrogen and NG storage, fuel cells and batteries, stack gas scrubbers, hydrocarbon traps and CO2 sequestration. The HPVA Series of gas adsorption analysers uses the volumetric technique, which involves introducing a known amount of gas (adsorptive) into the chamber containing the sample to be analysed through a dosing process. When the sample reaches equilibrium with the adsorbate gas, the final equilibrium pressure is recorded. This data is used to calculate the quantity of gas adsorbed by the sample, and the process is repeated at given pressure intervals until the maximum preselected pressure is reached. Each of the resulting equilibrium points (volume adsorbed and equilibrium pressure) is then plotted to provide an isotherm. The HPVA Series of gas adsorption analysers consists of solid-state pressure transducers with silicon element mounted to a hastelloy isolation diaphragm featuring a high-integrity glass-to-metal seal. Excellent reproducibility and accuracy are obtained when separate transducers are used for dosing the sample and monitoring the pressure in the sample chamber.